Review: Put on Your Pjs, Piggies! It’s pj time at Bedtime Barn, but the piggies want to keep playing! 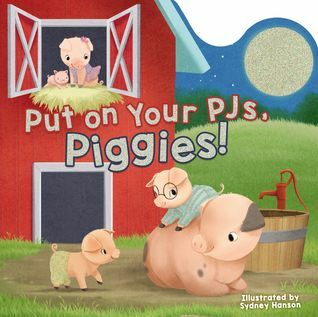 Get your little ones ready for bed with Put on Your PJs, Piggies!, a giggle-inducing story that will convince even the most stubborn bedtime resisters to cuddle up for sleepy time. Children will love the sweet artwork, silly characters, and sparkly glitter on the barn-shaped cover. The playful pigs in Bedtime Barn don’t want to go to sleep! Will they ever put on their pjs and settle in? “I want to play!” squeals the littlest pig. “Let’s have a chase!” one pig cries out. Put on your pjs, Piggies! If your little ones insist they aren’t sleepy, make bedtime more fun by curling up with this playful story. Once the playful pigs hit the hay, your sleepyheads will realize that bedtime isn’t so bad after all. Put on Your Pjs, Piggies! by Laura Neutzling is a super cute book about three little piggies. Each one trying to stay up instead of getting ready for bedtime. The book pages rhymed. The book has a small mention of let’s say our prayers before bedtime. But otherwise, it was just a silly yet fun children’s book. The pages are beautifully illustrated for this story. Little kids from babes to kindergarten will enjoy this story. Overall, I do recommend it to all.